Awards: Winner of the First Prize for Lighting Design at the Codega Awards 2018. 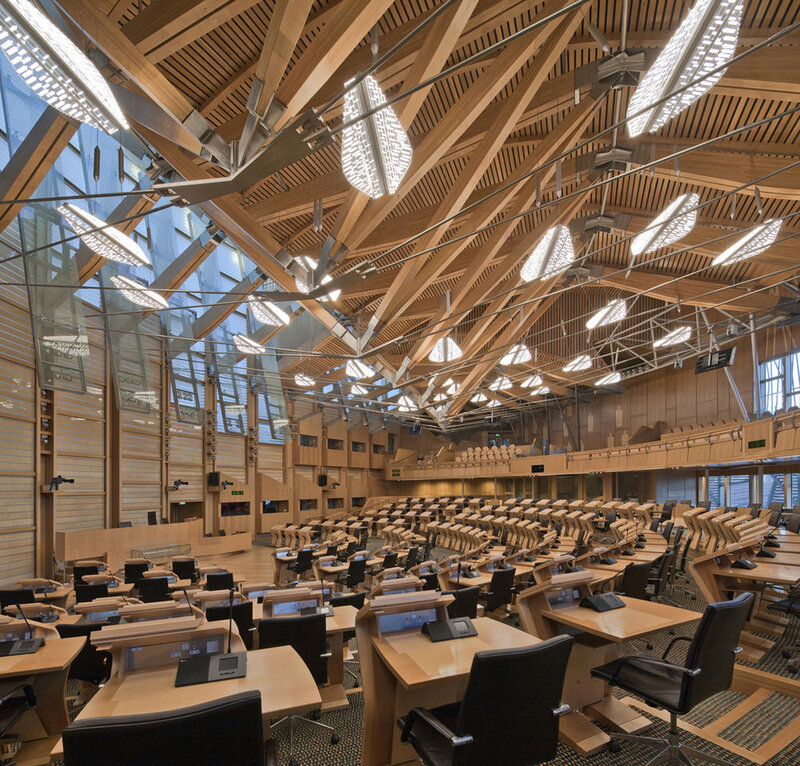 The Debating Chamber in the Scottish Parliament effectively functions as a TV studio during parliamentary business. At other times it is presented to visitors as a fine architectural space. The new lighting uses specially designed LED light guide fittings to provide soft broadcasting light, with LED spotlights providing front fill. The project includes daylight management, to prevent direct sunlight ingress from the West facade. A full DALI control system manages lighting for different functions and times of day. The scheme has a design life of 25 years, comparatively saves 60% energy of the previous scheme, and requires minimal maintenance. The project brief was to review the existing lighting, which was expensive and difficult to maintain. The installed fittings were also obsolete and new HDTV cameras required improved lighting to maintain broadcasting standards. The installation has exceeded the expectations of the broadcasting team and has received countless positive comments from the client and individual Members of Parliament. The fitting shape reflects the plan-form of the chamber, and the light guide extractors are the graphic figures used elsewhere in the chamber. The quantity of graphic figures represents the number of sitting MSPs. The layout and height settings allow the fittings to appear randomly placed in the complex ceiling structure, yet they achieve the required lighting distribution. Daylight louvre design was developed through time lapse photography and 3D modelling of the chamber. 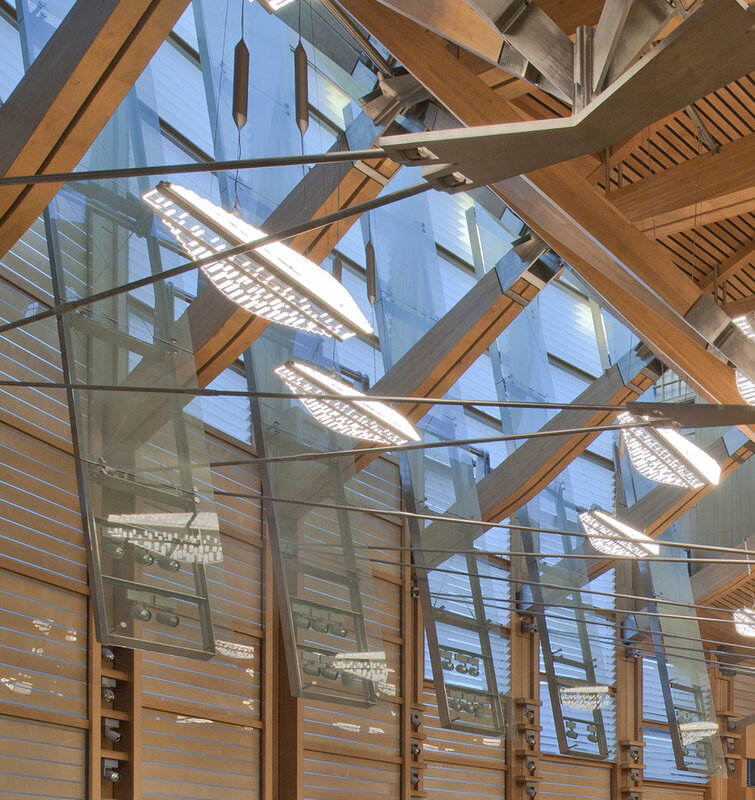 Iterative modelling of the louvres compared to the captured time lapse determined optimal angles and spacing to exclude direct sunlight, but retain effective daylighting within the chamber.